My daughter bolted upstairs from the kitchen this morning, sickened by the smell of cat food. I buy the tinned variety and every morning the three cats get a serve of wet food, as opposed to their evening’s serve of dry. My daughter has been sleeping downstairs these last few days because she is unwell, a virus of some sort presumably, but each day the diagnosis changes. She has not been able to eat and the smell of cat food was the last straw. I tried to feed the cats in the hallway away from the kitchen but it was not easy. The cats are creatures of habit. They were confused about this new position for their breakfast and I needed to keep the kitchen door open to entice them back inside the hallway. The smell wafted through to my daughter despite my best efforts to protect her from further nausea. It is hard dealing with competing interests. My head is filled with them at the moment, beyond family and work demands, competing projects: a paper here, a book chapter there and finally this idea of turning my thesis into an accessible book. Speaking of old women in shoes, my mother has declared she will now live till she turns one hundred, at least she would like to do so assuming she continues to feel as good as she does now. I shudder at the thought. That is another eight ears. Eight years of travelling down the freeway for half an hour each way every weekend to visit my mother in her retirement village home. It is a repetitive journey and time spent with my mother is even more repetitive. Her memory is fading, her short term memory that is, so unless we get onto a topic from her childhood we are stuck in a Ground Hog day type scenario where we keep going over the same old ground. I try to be tolerant. I try not to groan outwardly as I grown inwardly when my mother asks me for the fifth time what my youngest daughter is up to these days and how many grandchildren does she have. ‘Nine,’ I tell her. ‘Nine grandchildren, the same number as your children.’ That should help her to remember, but she has a mind only for the past, the future is a matter of clocking up years so that she can boast about reaching one hundred. This is a harsh reading of my mother’s motives but a familiar one. In years gone by my mother measured her success by the number of her children and then later by the number of their children and now by her grandchildren’s children. A whole dynasty behind her and beyond. Why should she not crow? Her life has been her family. She was obliged to leave school as a fifteen year old to take care of her mother’s family of seven before she married seven years later and began her own tribe. So many women of my mother’s generation were forced to stay at home to care for children, to give up all aspirations of a career, not even to entertain one in the first place. The cockatoos are out in force again this morning. 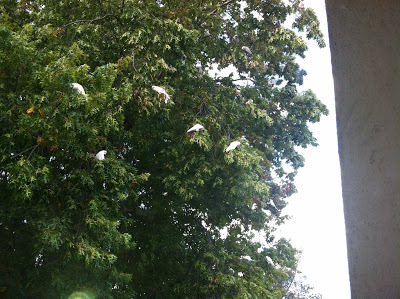 Whole sheets of white cockatoos with their yellow tufts aloft swoop down onto our oak tree in the back yard. They hack at the acorns and leave them in smashed piles on the bricks. They eat only a fraction of the acorn and discard the rest. They’re out there now cluttering the sky with their clatter. Last week I saw a red berry tree on our street that was white with their wings. They are like locusts and a novel sight here in the suburbs. Usually we see them only in the country. Perhaps my daughter is right. They are some bastardised strain of cockie that proliferates like rodents. Underneath their flapping wings the feathers are yellow, the softest of yellows, lemon yellow. It makes up for the dull white of their feathers. Close up, now that my daughter says as much, I can see they have none of the beauty of the country cockies with their pink or yellow tufts. These cockies have no tufts, other than a stubby white shock of feathers, like a lump on their skulls and they are noisy. They travel in flocks that must consist of hundreds of birds but they don’t scare me, not like the birds in Daphne du Maurier’s story The Birds. These birds make me want to laugh. Messy buggars. Their shrill cries and the plop of acorns on the roof and gutters, their broken shells underfoot, could be the stuff of life. Busy mothers with too many children to feed. What else can they do? I think they are wonderful Elisabeth. I think all birds are wonderful, including crows! I'm so glad I'm not the only one to have my teeth set on edge by dealing with the elderly! My F-I-l! Eighty nine and holding….He'll probably outlive us all! Repetitive is the operative word, and what's with the attitude of "Nobody in the world is as important as me?" I have a similar photo of a green tree with white specks that are cockatoos, I don't know what sort, I just call them all cockies. they come swooping around about 8am-8.30am, but never stay anywhere close long enough to get a decent photo. I'd like to live to be 100, but only if I still have my mind. Sitting with my grandmother was exhausting as she drifted in and out of memory. I loved her but so struggled to find things to talk about, and hated going through the fifteen repetitions of who I was and who I belonged to. Thanks for naming the frustration. The birds are corellas. They eat all our almonds and pears – but this winter, we will prune our trees low low low and net the things and then the buggers won't get in! I tend to agree with Andrew and Allison that they are Corellas. I have flocks of 'em in my neck of the woods and see 'em while on my morning walk down by the footy ground they are delightful :-). wow is your mum already 92. Mine is 80 and she is still very good. I will see her in 2 1/2 months and I look forwards seeing her and my brothers again. My mum also start to repeat stories but I only speak to her once a week on msn. Corellas? They have not visited us this year although they used to do so around October when the new grasses were sprouting. I think they were after the moisture. This was before the rains of the last couple of years. They certainly do not have the stature of the white cockatoos, I think. I remember as a kiddie going to visit my paternal grandfather – who always seemed ancient but was only in his 60's or 70's – his endless war stories … women don't have those so the intovert onto the family, I am so grateful that I am born into this generation where at least we have the opportunity to bore everyone with our war stories and not just how smart are kids are! Apparently my wife was telling me about this last week. The only part I remember was something about some cockatoos wandering in, bold as brass, through an open window to feed at a writer’s desk while she was sitting there working. There was other stuff too but I don’t remember any of it. It’s my war cry these day: “I don’t remember.” I don’t remember most things. It worries me. I had lunch with my daughter on Thursday. I’d not seen her since New Year (when we did Xmas) and I reckoned it was time we caught up. I read her tweets so I get a general flavour of what’s happening in her life but I’m not one of those intrusive dads always on the blower looking for updates; I would have hated that at her age and I’m sure she appreciates the fact that I allow her to get on with her life without sticking my oar in. Not that I think my opinion would make too much difference; she’s a strong-willed girl, my lassie. She doesn’t get on well with our cockatiel. When the ‘blonde birdie’ comes a-calling he tends to keep himself to himself; he knows she’s scared of him and she is. We occupied the hour with little difficulty—it is only an hour—but my mind often goes blank when she asks what’s been happening with us because so little happens and, as I’ve said, I tend to forget most of it anyway. She has a cat though (needless to say I’ve forgotten his name) and dotes on him. That pleases me. People who hate cats are the spawn of the devil as far as I’m concerned. Carrie’s going back to the States on 7th May. She’s only staying for a fortnight this time. Her dad pressed her into staying for three weeks the past two times but both she and I found it too long. One week is fine—I can enjoy myself even being alone for a week not that I do anything different—and the second is tolerable but that third week really dragged. For her though it’s three weeks straight with her mother who’s suffering from dementia and, like your mum, goes over the same ground over and over and over again. Her father’s deaf but her mother’s hearing is surprisingly sharp and so when we share our daily phone call mostly she either talks in code or says nothing because invariably her mum will overhear and take it the wrong way; she has quite the persecution complex and you really don’t want her to get fixated on something negative because she just worries it to death. My mum died in her late seventies (I forget the exact age and the date) and by that time I usually visited every couple of weeks to mow the lawn and trim the privets which was about the extent of my gardening; maybe pull a few weeds. The trips usually went the same way, a bus trip to Ayr to do the rounds of her favourite charity shops (they had a better class of junk than the local shops) because she never let a day go by without making full use of her free bus pass, then lunch, then the garden, a cup of coffee and then off home. The conversations were all the same though. She learned that Carrie has some Indian blood in her and after that she kept looking for clothes with fringes because, “your people like them.” Every time the same. I did my duty though as I’m sure you will continue to do yours. Seeing photos on your blog – engaging. Your style of writing – priceless. I look forward to your book. You can't imagine how much I ruminate about revenge and how much I practice it, even though I oughtn't. How one should be and how one is – always at odds, but the stuff of much expressive writing. "Busy mothers with too many children to feed." I was struck by this comment at the end. It serves as the glue to your post, the overall feeling a mother feels when so many demands are placed on her. You're in the middle of all these demands, the major wheel. Give yourself a vacation, and often, and begin to delegate or you'll be too tired, too overwhelmed to carry on. And that is is "what else can 'she' do?" Nice patio. I can see myself there reading the sunday paper. I have become quite the bird watcher since our backyard has become the canteen for a flock of rainbow lorikeets. Absolutely irresistable characters and I miss them when they don't come. This summer however, they abandoned MY virgilea blossom for the pear tree in the yard behind us! I hardly saw them at all. They would spend the day hidden in our huge gum tree chatting and gossiping endlessly then fly over to the peartree smorgasbord whenever they fancied. Strumpets! As for ageing, our sons have never known grandparents, so they have never seen us care for ageing and elderley relatives and have no idea what to expect. It will either be extremely stressful or highly entertaining – I wonder which? (our youngest has already chosen our nursing home, discovered when he used to do a local pharmacy delivery run, age 14. He said the aroma of the evening meal and the layout of the rooms were the best he came across.) Small blessing, I guess. PS I already bore my sons with my constant need for updates on what they have already told me 10 times. Beautiful birds! And you reminded me of the Wallace Stevens poem "Sunday Morning". So a double thank you for a great post. we should imagine ourselves as a cockatoo. we should imagine ourselves as your mother. there is an extraordinary blogger, william, who write about his mother's Alzheimer's condition. have i sent you to him before? (again, i commend your honesty. honesty on this level is difficult, yet so important, my mother has declared she will now live till she turns one hundred, at least she would like to do so assuming she continues to feel as good as she does now. Aged parents and domesticity — I think of Virginia Woolf noting down the number of years that had passed since her demanding father's death in 1904. On 28 November 1928, her deceased father's birthday, Woolf's diary records the observation, "His life would have entirely ended mine. What would have happened? No writing, no books;–inconceivable." And since my mother's suicide, my father's death after a massive stroke, I feel more free, no longer as haunted and caught up in trying to connect, to be some kind of daughter. I love the unsentimentality of your writing Elisabeth, the plain truth of it. I believe they are Corellas, Andrew, now that I've explored them through Google and asked enough questions. These birds seem to attract very mixed feelings from people, either of love or hate. 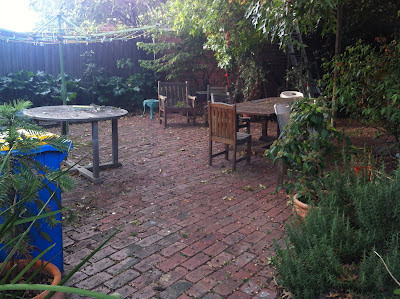 I look at my backyard and all the debris and I'm not sure I could say I love them, but then again, if they stay away for a bit now I'm sure I could forgive them,but if they return again too soon, I might feel differently. Good for you, Fazlisa. To love all birds, including crows, that says something. That 'attitude of "Nobody in the world is as important as me?"' is hard to stomach, Molly, as well you'd know. I'm not sure it's simply a feature of extreme age. I expect it is a crystallization of earlier traits. You might live to 100, River, but I expect the quality of your mind would have to be compromised. I don't know but since she turned 85 my mother has gone down hill, mentally, and it's been much worse since she turned 90. The body and mind tend to wear out. Corellas and aging, Alison. They both eat away at our goodwill. I know exactly what you mean about time with your grandmother sapping your energy and I'm with you when you talk of a need to protect your luscious fruits from those greedy birds. They only peck at the acorn before discarding the rest. Ah now Windsmoke, you're one of those folks who love these blighters, these corellas. But have they stripped your fruit trees bare yet? I wonder. At eighty, Marja, my mum was still pretty terrific, both health and memory wise. Her forgetfulness set in when she turned ninety. Before then she was always pretty sharp. I hope you have a lovely time with your mother. My daughter is already feeling better. Thanks, Marja. I suspect your corellas have moved on to visit us, Christine. I've not seen them before in sunny Hawthorn, but you, I imagine have met them often, from what you say here. I wonder that they're now moving into the city, given we are well past the drought. Thanks for your good wishes, Christine. Each generation has its store of stories, Jane. Some are boring, others captivating. I enjoy it when my mother reflects on her past, her distant past. It's the recent past that I find tedious. It's there where she forgets most and becomes most repetitive. But would I rather have the squawking of birds, or that of an ageing relative with too few current interests to hold a real conversation? The jury's out! I love all the noisy cockatoos – real and fake. Raucous, busy and happy – perfect Aussies really. Hello, Elisabeth, and thanks for stopping by. I've been by here often to read, but never left a comment before. I enjoy your perception, but never felt I could analyze the situation enough to respond. I would say about old people's stories, I devised a technique not to be bored to tears by my grandmother. I would ask a question about her childhood and then I only needed to listen as she went on and on. Now I profoundly regret I did not write her stories down. In Aussie slang a cockatoo was a bloke posted to warn of police approaching at illegal gambling places. One character I knew (always hapless) fell from a ladder while being cockatoo and broke a leg. I thought you might enjoy my tale about birds, Jim and as ever have so much more to add. Your cockatiel sounds like such a joy. These cockies were not. Interesting that your daughter is fearful of the bird. I wonder why. I have a friend who's fearful of all things that fly about her head, insects and the like, maybe even birds if they fly low enough to swoop. Needless to say, I'm fond of cats. I find them easy to accommodate, more so than dogs who need so much more love and attention. Or at least that's been the case in my experience. As for memory. It fades for all of us and the older we get the more sensitive we become to forgetfulness. I consider I have a good memory. I need it for my work and also for my writing. I try to remember events and experiences and although I know I distort those memories along the way I try to retain their essence. Thanks for all the kind words, Kass. It seems to me my book will be slow in the making, but isn't that the way with most things. As for revenge, or vengeful feelings. Make no apologies. To me such feelings are universal and only a problem if they get enacted in vicious and dangerous ways. It is tough, Rosaria and I can feel overwhelmed, less by the mothering and grand mothering, and more by the demands of life itself, that extend well beyond the family. In many ways my family offer solace, when the outside world proves too much. My family, my work and my writing give me back easily as much as they take but the demands of living in a complex world take it out of me at times. I won't say that my mother enjoyed the raising of her nine children beyond our infancies, Kirk. We've all sensed she enjoyed her babies best of all but once out of nappies, the older ones tended to care for the younger ones, which is often the case with large families. My mother is absent from my memory as a youngster, Kirk. My siblings feature more strongly in many ways. But how could any one mother manage so many children? Something has to give. I found it hard enough with four and I know I let my children down often enough. In the end I suppose we can only do our best. It sounds as though you have a wonderful orchestra of birds in your yard, Karen. You describe their behaviour so beautifully here. As for growing up without grandparents, I think it must be hard. You don't know what you miss unless you have it. My kids also stir us about their plans for our old age and they also find my occasional tendency not to listen attentively a chore. But we all suffer from a failure to hear one another and remember what was said from time to time. It has more to do with distractions than with old age I suspect. I'm glad my post evoked thoughts of Wallace Stevens' Sunday morning, Dave. What a wonderful reflection of Sunday. Thanks. I'm glad you don't mind my so-called honesty, erin. sometimes it's hard to write it as we feel it. Thanks for the link to William Michaelian's work. I know it well, but it's wonderful to be reminded. He is such a masterful writer and a generous lovely person as well person. The blogosphere is populated by such fantastic writers and people, including you. We are privileged indeed. Granted, it's not much of a choice, Red Nomad Oz, the squawking birds – chainsaws of the skies – or the ravings of a demented relative. Mind you my mother is not yet that bad. I, too, enjoy the expression: chainsaws of the skies, a new one for me. You'd probably be missing our raucous birds, Kath. I can't imagine their equivalent in Europe, though I suspect they exist, though perhaps a little less noisy. Thanks, Kath. I'm never as bored with my mother, Joanne, when she recounts her childhood stories. My mother is a natural storyteller when it comes to remembering her past, her girlhood and life In Holland. It's the recent events that cop the repetitive battering. How lovely to hear from you here now and to think you've already been but did not leave a card. Thanks, Joanne. I can understand why such a character, one posted outside an illegal gambling joint, was called a cockatoo, Robert. It's a new meaning for me. Thanks. I'm sorry, I nearly overlooked your wonderful comment, Mary La, nearly but thank goodness not quite. Thanks for that splendid quote from Virginia Woolf about her father : "His life would have entirely ended mine. What would have happened? No writing, no books;–inconceivable." Our parents can certainly impede our growth if we let them as we grow older and even if we don't, I'm sure their physical presence can be an issue for so many of us. It's one of the reasons I hear it said that the present generation of baby boomers have trouble 'growing up' because their parents can tend to stay around so long the baby boomer children are in a perpetual state of adolescence. Of course, that's simplistic but it rings true to me. I am a bird person, have always had one for a pet…love and feed the ones out there on the deck and in the pond- BUT some Englishman brought over some Starlings from his country home, because he was homesick, and they have , like rats, taken over- they are not particularly pretty nor do they have a good song…they bully all of the other birds and toss their babies out of their nests- they eat everything in sight and are not afraid of anything! They travel in gangs! Starling is such a pretty name for these rascals- they are SO not! Cockatoos, competing projects and so many children – sounds overwhelming, and yet you weave it all together so beautifully. In order to make writing space, I find it has to be carved out and fiercely defended. Not always easy, but good luck with it all the same. Those starlings sound a lot like our rabbits, Linda Sue. It makes you wonder about the balance of our ecosystems and how they can be tipped into disorder and chaos. It's hard to love creatures and plants of any sort if they take over and dominate to get more than their fair share. I suppose the same goes for humans. It can be hard to carve out space for writing among all the other demands but we keep on trying, don't we Juliet? I used to be a big fan of birds, but then they moved into the trees just outside our apartment bedroom window in the courtyard and they start going off at 5:30 in the morning. I don't love them anymore. It's true, Tracy, we tend to admire animals by how much they serve our interests. And no, i did not read your comment as a passive aggressive go at my relationship with my mother, though I can see how you might come to that and there might even be some truth to the notion.